Bone spurs in the spine and joints can be particularly painful. The human body is very good at fixing itself… sometimes almost too good. As we get older, the discs and the joints of our spine and other bony structures undergo changes; some of these changes are degenerative in nature such as “wear and tear”. While degeneration occurs even in the healthiest of people, it can be magnified by a number of things such as poor nutrition, an injury, repetitive strains or bad posture. When there’s continual stress on a bone or joint, extra bone builds up as a protection against future stress. The problem with this scenario is when this extra bone (which is not painful by itself) begins to rub against nearby tendons, ligaments or nerves. These tissues then wear away over time, and painful symptoms can develop as a result. This situation of extra bone being built in the body is known as a bone spur, also called osteophytes. They most commonly form around the joints of the foot, spine, and shoulder, but a bone spur can form on any bone in the body. Those who are engaged in frequent physical activity, such as athletes or dancers, can be prone to bone spurs. They are also a common side effect of osteoarthritis. When cartilage is destroyed by the existing arthritic condition, the body steps in to try and repair the damage, and bone spurs occur. Sometimes bone spurs are simply a side effect of the body’s normal aging process, and can actually be of benefit to an aging body. Bone spurs can reinforce joints that are losing cartilage in some cases. Also commonly, a bone spur starts when arthritis, bone misalignment, aging or wear erodes joint cartilage until bone rubs on bone, causing inflammation. The body then deposits calcium salts in that area and grows new bone in an attempt to become stronger. T his buildup can make the situation worse by continuing further degeneration, irritating a nerve root and restricting normal movement. In people with arthritis, for example, bone spurs develop in the joint or disc spaces, where cartilage has begun to break down or deteriorate. Many people mistakenly believe that bone spurs are spiky pieces of bone that stick out often along joint margins, and cause pain in the neck and back. The truth is that bone spurs are not spiky, but are smooth and usually painless. Any pain that is experienced is usually a result of other conditions that may be present. Many people are unaware that they have bone spurs until they have an x-ray for other conditions. However, in some cases, bone spurs can cause a significant amount of pain. Bone spurs are smooth, bony pieces that form on the edges of the bone. They usually occur where bones connect to one another in the joints; however, they can also form on the spine. The majority of bone spurs present with no symptoms and go undetected for several years after they have developed. Bone spurs are normal pieces of bone that form as people age, usually as a result of normal wear and tear from osteoarthritis. The most common cause for bone spurs is the normal wear and tear that develops as a result of osteoarthritis as people age. When an individual has osteoarthritis, the cartilage that is located at the ends of the bones is broken down. Bone spurs are the body’s defense mechanism against this breakdown of cartilage. The body begins forming bone spurs near the damaged area to repair the cartilage that was lost. When bone spurs are present in the knee, you may experience pain when bending or extending your leg. This is a result of bony growths interfering with the normal operation of bones and tendons in the knee. Bone spurs that form on the spine can restrict the space surrounding your spinal cord. When this happens, the spurs can pinch the spinal cord or pinch the nerves at their roots. This can lead to numbness or weakness in the arms and legs. When bone spurs develop in the hip, you may have difficulty moving your hip and you might experience pain in your knee. Your normal range of motion may be restricted. If bone spurs form in the shoulder, the rotator cuff muscles and tendons can develop tendinitis, a painful condition that causes swelling. It can also lead to tears in the rotator cuff. Bone spurs in the fingers present as hard lumps that form under the skin. Individuals with bone spurs in the fingers often have a knobby appearance to their fingers. The symptoms of bone spurs or bone spur-related conditions will depend specifically on where the bone spur is located. Bone spurs can occasionally break off of the main bone they are attached to. When this occurs, the broken pieces, known as loose bodies, can float around the joint or adhere to the joint lining. This can lead to joint locking, which can come and go as the loose bodies float about. As stated previously, many of us can develop bone spurs in one part of our body or another, and not even know they exist. Some of us, however, are not so fortunate. Osteophytes can cause pain in the neck and back, as well as radiating type pains through the extremities such as the arms and legs. Bone spurs in the spine can be particularly painful. 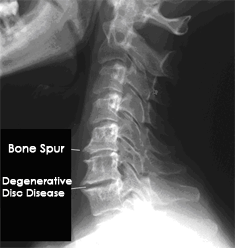 One area where bone spurs seem to be prevalent is in the disc spaces between vertebrae. 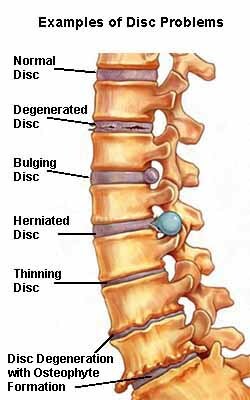 As the discs and their attached ligaments begin to wear down, the body begins to thicken the ligaments. Over time, the ligaments can calcify and shed small fragments. The presence of this additional material in the spine can cause compression and pain. Lastly, bone spurs can occur in the heel of the foot. Bone spurs can quietly exist in the body without causing any problems. 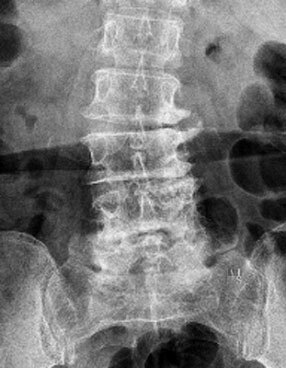 It’s not uncommon for a patient to have an X-ray for a different problem, and discover bone spurs that are asymptomatic. It’s when the new growth of bone comes into contact with other tissues and causes trauma over time that a problem develops. Symptoms can include swelling, tearing of nearby tissues, and pain, depending on how much damage is being done. There can be some lost motion if a joint is affected. Symptoms can also vary with the area of the body being affected. When a doctor discovers bone spurs on an X-ray, no treatment will be initiated unless there are obvious symptoms that the spur is doing some damage in the body. If the pain is great, some non-steroidal anti-inflammatory medicines may be medically prescribed. Surgery may be indicated if the spur is causing a lot of distress or damage. This is especially the case when arthritis is involved, and often bone spurs will be removed while a doctor is surgically repairing arthritis damage. The chiropractic approach to bone spur treatment is to restore the curve and flexibility of the spine or joint. When the underlying problem in the spine or joint is fixed, usually the body may absorb the bone spur. Our patients usually experience a relief in discomfort simply by improving the mobility of the spine or joint, and soft tissues with chiropractic adjustments, physiotherapy and low-level laser therapy (LLLT). A chiropractor can’t make a bone spur go away, any more than a medical doctor can. Chiropractors don’t operate – a costly and invasive procedure that should only be considered seriously when all other less invasive treatments have been rendered ineffective. When a patient approaches a chiropractor for treatment for a bone spur, the patient has to understand that a bone spur may not actually be the problem. Many bone spurs cause no problem whatsoever. Just because a bone spur exists doesn’t mean it’s automatically the source of whatever pain or discomfort a patient may be experiencing. A chiropractor would initiate an examination to determine if chiropractic adjustment would be safe to do on the patient, and proceed cautiously with a course of treatment to see if any improvements are made. Other therapies may be called into play, such as ultrasound and low-level laser therapy (LLLT) to deal with pain and inflammation, and deep soft tissue mobilization depending on the patient’s situation. Chiropractic treatment is scientifically sound and holistic in nature, and can be very effective. As stated previously, bone spurs are treated only if they are causing symptoms. The type of treatment you receive will depend largely on the location of the bone spurs and the severity of the pain or other symptoms they are causing. Initial treatment is directed toward decreasing inflammation and avoiding re-injury when possible. Local cold application can help when the location of the bone spur is accessible. After 1-2 weeks of rest, chiropractic adjustments to the affected area often alleviates the pain associated with bone spurs. Chiropractic adjustments also help restore flexibility and strength in the joint. In addition, these spinal adjustments may decrease the pressure on the nerves, causing immediate and lasting pain relief. If necessary, your chiropractor may recommend readily available over-the-counter (OTC) medications or refer you to a medical doctor for prescription medication or an injection of steroids. Medications commonly prescribed are muscle relaxants and anti-inflammatory medications. Cortisone injections may relieve inflammation and swelling resulting in pain relief, although it is only temporary, and patients often require more than one injection. If range of motion is limited or severe pain is present, surgical removal of the spurs may be required. Dr. Pisarek can help you determine the best treatment plan if you suffer from bone spurs. With the exception of certain conditions like osteomyelitis (a bone infection that may leave a bone spur formation) or Charcot foot (neuropathic breakdown in the feet of diabetics), bone spurs can be a symptom of a common "body imbalance". Basically what happens is that a vertebral subluxation (a misalignment of a vertebra that interferes with communication between the nervous system and the body) of your atlas, or C1 vertebra, occurs. When it misaligns, it will rock forward or backward to your left or right. This will in turn cause your head to tilt to the left or right. Because your body was not intended to move around with your head hanging to the side, the vertebrae in your spine will compensate. First your C2, then C3, and so on and so forth. 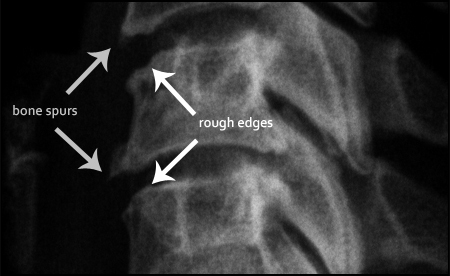 This will cause compensatory misalignments all the way down your spine, possibly even curvature such as in scoliosis. Due to this domino effect of misalignments, the vertebrae will be stacked unevenly on the ones below. This means that one side or corner of a vertebra will unnaturally bear more mechanical stress than it should. The side of stress will experience more bone growth to bear that added weight, hence a bone spur in your spine. Because of this spinal imbalance, your pelvis will tilt to one side. Usually the high side of the pelvis will result in that leg appearing shorter than the other, thus causing you to place more of your weight on that side due the imbalance in your pelvis. The added strain on the leg bearing more weight will cause your bones and muscles to work harder on that side, including the bones in your feet. In this example, a bone spur in the heel may very well develop because of the added stress the Achilles tendon is placing on your calcaneus (heel bone). If you think of a bone spur the same way you would a callous, it makes sense. Callouses develop on our hands when we use them a lot, such as when someone lifts weights on a consistent basis. But if that person stops lifting weights, the callouses diminish and go away eventually. A bone spur is basically a bone callous. Take away the undue stress and bone stops growing. In some cases it can even be reabsorbed by the body, as long as that undue mechanical stress goes away and stays away. 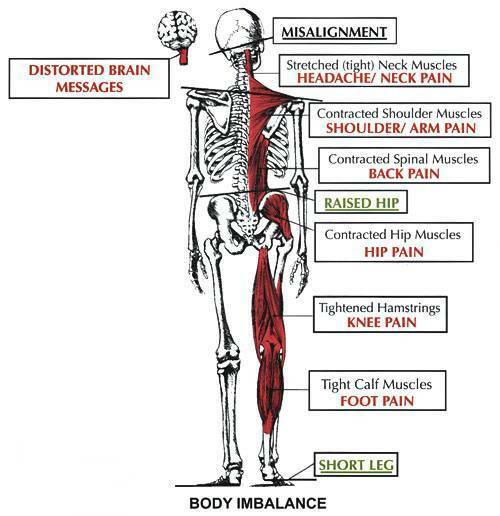 How do you get rid of the undue mechanical stress on your spine and joints? Getting your spine checked by a chiropractor is the number one thing you can do to make sure your spine is healthy. Restoring proper function to the spine and nervous system are the core reasons chiropractic exists. Having misalignments in your spine for long periods of time can be a real problem, and can lead to even bigger problems, the least of which may be bone spurs. You are never too young or too old for chiropractic, so call Dr. Pisarek at Advanced Healthcare today to get checked, adjusted, and on your way to a healthier, more optimal way of life. Someone who visits a chiropractor regularly to maintain spinal health is much less likely to develop bone spurs. One of the most common conditions leading to bone spurs is osteoarthritis. If the changes that lead to arthritis are reversed early enough or the advancing degenerative process is slowed down, then one can prevent it from becoming a progressive disease. Spinal and joint mobilizations, stretching and strengthening exercises may also be recommended along with dietary changes as well as nutritional changes to maintain a good balance of calcium and magnesium. Call Advanced Healthcare for an appointment with Dr. Pisarek at (416) 633-3000 to help determine what treatment options can be used to help your condition(s).